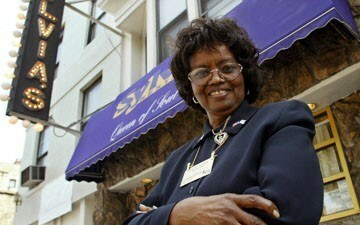 Sylvia Woods, the “Queen of Soul Food,” was the founder and owner of the world famous Sylvia’s Restaurant, located in the historical village of Harlem, since 1962. Sylvia, born and raised on her mother’s South Carolina farm, had dreams at a very young age of marrying her childhood sweetheart Herbert and of one day trading in the cotton fields for the bright lights of New York City. Young and determined, Sylvia received her beautician’s license at night while attending Junior High School during the day and opened the first farmhouse salon in her hometown of Hemingway, South Carolina. Sylvia and Herbert met when she was eleven and he was twelve while picking beans after school. In 1944, Sylvia married Herbert and started her journey towards a brighter future. Harlem called, and Sylvia answered, as she became a waitress at Johnson’s luncheonette. 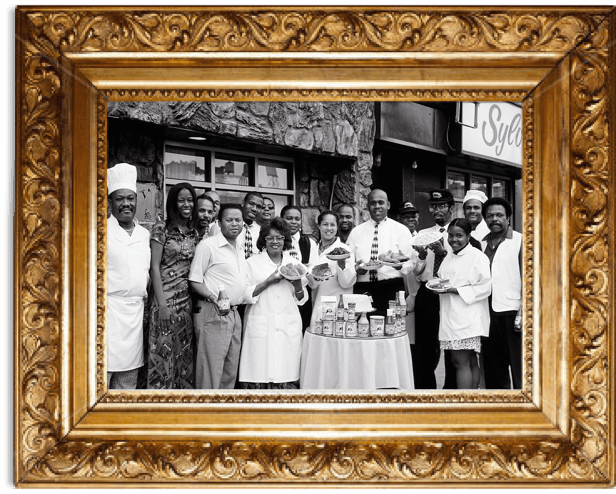 In 1962, after several years of dedicated service to her employer, Mr. Johnson recognized Sylvia’s entrepreneurial spirit and sold her the luncheonette. Julia Pressley, Sylvia’s mother, whom was a farmer and mid-wife, mortgaged her farm to loan her the money for the purchase. The then small luncheonette which consisted of 15 stools and six booths, has now flourished into a family-owned enterprise which consists of: Sylvia’s Restaurant in Harlem, Sylvia’s Also, a full-service catering hall, Sylvia’s Catering and Special Events Division, a nationwide line of Sylvia’s Food Products, two deliciously amazing cookbooks, and ATOC, Inc., a real estate holding company.